The Anatahan Volcano north of Saipan has resumed rumbling in recent days, spewing steam and ash as high as 50,000 feet, the U.S. Geological Survey said Tuesday. The latest satellite images from the Air Force Weather Agency showed a cloud of ash and steam rising 10,000 feet in the air and extending about 375 nautical miles from Anatahan island. Thin ash and volcanic smog, or vog, also spread 815 nautical miles northwest of the island, the satellite data indicated. An eruption Sunday afternoon was the latest since the volcano had its largest historical eruption on April 6. That explosion expelled an estimated 50 million cubic yards of ash, grounded several commuter flights, and exacerbated asthma conditions for residents of Saipan, about 80 miles away. The volcano also erupted on June 11. Vog from Anatahan's activity in recent months has reached as far as the Philippines and Palau. Though the geologists have found evidence of ancient explosive eruptions by the volcano, the first historical eruption began in May 2003. That prompted the evacuation of the island's 20 or so residents to Saipan. The island has been uninhabited since. Officials of the Commonwealth of the Northern Marianas have banned all visits to the island except for scientific expeditions. The CNMI government urged airplanes to pass upwind or at least 10 nautical miles downwind of the island. While the volcano is not now dangerous to most aircraft, conditions may change rapidly, the authorities said. The eruption is at least the sixth in the past two years. The Northern Mariana Islands, about 3,800 miles southwest of Hawaii, have nine active volcanoes. The island chain is home to about 70,000 people. How to classify the size of a volcanic eruption? On Saturday, Halsor and Toothill left for Yellowstone National Park in Montana, where they will join staff from several universities around the country to research the Yellowstone caldera. The caldera is a large crater, 31 miles across, that formed from released volcanic material over thousands of years. Halsor said the caldera is referred to as a "super volcano," one that erupts 1,000 times more ash than a normal eruption. "These are enormous volcanic events," Halsor said.Halsor and Toothill have conducted GPS research at the caldera since 1999. Research permits in the park are difficult to obtain, Halsor said, adding they were invited to participate by head researcher Dr. Craig Chesner of Eastern Illinois University.Only a dozen universities from around the country are involved with the research. "As a scientist this is a unique opportunity. Only a handful of people in the world do this type of research, and we feel privileged to be a part of that," Toothill said. "Being involved in this is an indicator of the quality of the GPS program at Wilkes. "Past events show the caldera erupts every 600,000 years. The last eruption was 630,000 years ago, Halsor said, and the current research shows some interesting developments. "At Yellowstone, what we're seeing is one year the ground may rise up and next year it may subside a few millimeters or centimeters," Halsor said. "We're watching a trend that shows a larger uplift sustained over several years. If we continue to see this accelerated uplift, it might be the early stages (of an event). The last caldera eruption spewed 1,000 cubic kilometers of volcanic material into the air, Halsor said.Although the pattern or eruptions indicate the caldera is ready to blow again, Halsor cautioned it probably won't be in our lifetime. "It would not be surprising if another large eruption were to occur at Yellowstone within the next few 1,000 years," he said. "The overall consensus is there's nothing currently indicating the caldera is on the path of erupting in a big way, but if it were to begin along that path it wouldn't be a surprise to the geological community. "Several Wilkes students accompanied Halsor and Toothill for the research, which continues until June 26. Toothill described the work as "intense," complete with around the clock research and wildlife encounters. "We monitor the caldera all day and all night, and there's some unique problems with wildlife," he said. "You have to be very alert because some of the monitoring sites are in grizzly bear habitat. "Collected data is brought back to Wilkes to be processed and compared to past years' research. "It's very exciting to be involved with a community of geologists doing research at one of the most volatile volcanic systems on the planet," Halsor said. "Being able to apply our mode of GPS technology to this unparalleled ecosystem is a privilege." The Langila volcano has been erupting regularly this month. Langila volcano, located in Papua New Guinea’s West New Britain province, 200km west of the provincial capital, Kimbe, has been erupting continuously since Thursday, 2 June 2005 and discharging heavier than normal loads of ash into the sky. Although the prevailing wind conditions pushed most of the initial ash fall out to sea, lower -level winds are now redirecting the ash back onto the island. This has led to reports of increasing cases of respiratory and eye irritation complaints and a growing concern that it will become necessary to evacuate the local population. Approximately 10,000 people are reported to live in the vicinity of the volcano, which is one of the most active in New Britain, with frequent eruptions recorded since the 19th century. Instruments installed in the vicinity by the Rabaul Vocanological Observatory have been damaged by lightening, so visual observation is the only means of monitoring the ongoing activity. On Monday (6 June 2005), the West New Britain provincial disaster office sent a team by helicopter to review the situation. The team found that 3486 people had been affected by the eruptions so far, mainly in the villages of Aitavala, Masele, Kilenge, Ongaea, Potne and Sumel, but also to a lesser extent in Vem, Galegale, Tauale and Laut. Villages that have so far experienced only light ash fall include Aimaga, Aipate and Gie. Fallen ash has damaged food gardens , spoiling crops growing above ground and drawing moisture from the earth, exacerbating the onset of the dry season. Food supplies are reportedly becoming low as a result. Water sources have also been contaminated, although at this stage there are still some sources of potable water. There has so far been no damage to buildings or infrastructure reported. The West New Britain provincial government has declared a level-two alert, noting that "there has been a general trend of a progressive increase in the intensity and magnitude" of volcanic activity. The provincial disaster office (PDO) has estimated that an increase in hazards arising from the volcano could see the number of people affected rise to as many as 6000. The provincial authorities are encouraging voluntary evacuation of affected areas. Some evacuees have reportedly already begun making their way to safer areas such as the Anglican mission at Sag Sag, southwest of the volcano. Communication to the region is very limited, the provincial disaster office has informed the Red Cross that their only radio contact to the region has been unreliable since late last week and information available to date has often been passed on many times. This is further compounded by the remoteness of the region. Access is by sea (250 kilometres) or by helicopter. A representative of the Papua New Guinea Red Cross (PNGRC) travelled to the site of the volcano on Thursday (9 June) to conduct a needs assessment in collaboration with the PDO and to liaise with local PNGRC volunteers. All branches have been put on alert and asked to remain in communication with headquarters in case activation is required. Stocks of jerry cans and tarpaulins have been sent to Kimbe for distribution to people affected. Further relief items are prepositioned at the nearest branch in East New Britain. Scientists from the state-run Geological Survey of India will study the volcano in Andaman and Nicobar island to look for possible links between the eruptions and the December 26 tsunami that hit the area. The volcano on the Island spewed smoke, dust and lava this month, but Indian authorities said there was no threat to the environment and marine life. "Volcanoes and earthquakes happen independent of each other but there is scope for studying the link in this case," M K Mukhopadhyay, GSI deputy director general, said. A team of geoscientists is visiting Barren Island to collect lava samples. A GSI scientist said the tsunami caused 'readjustment of lethospheric plates' that might have disturbed lava pockets and caused the volcanic eruptions. The Andaman and Nicobar islands are situated on an undersea fault that continues to nearby Indonesia. The island chain has experienced hundreds of aftershocks following the powerful undersea earthquake that caused the tsunami. Over 430 people were killed and at least 3,000 are still missing after the into the Andaman and Nicobar islands. The first recorded eruption on Barren Island occurred in 1787. There have been a number of them since then, the last in Dec. 1994. The three-km wide island has sparse foliage that is eaten by goats that live there. It is India's only active volcano, with a 1.6 km wide crater and is situated 135 km northeast of Port Blair in Andamans, 1,200 km south off the mainland. A new crater has formed on the Colima volcano in western Mexico following powerful eruptions, the Mexican newspaper El Universal reported on Tuesday.Volcanologists discovered the crater during a monitoring flight over the 3 860-metre-high colossus. The scientists said that considerable amounts of volcanic boulders have piled up around the crater because of continuous explosions. A big rock is now protruding from the crater.The director of the civil defence force in the Jalisco state, Luis Salazar Saborio, told the newspaper that the structural changes were a sign of the continuing explosiveness of the volcano. Eruptions at a level of past intensity, or even stronger, can be expected. There is also a risk of debris avalanches, which could develop following heavy rains.But there is no immediate danger to the population, the civil defence force said. Forty-eight people who were evacuated from the area in the last week could now return to their homes. But officials said that the volcano continues to emit dust clouds that could be damaging to health. The Colima volcano is located on the border between the Colima and Jalisco states, approximately 600km west of Mexico City. It is among the most active volcanos in the world. Nearly four dozen people evacuated last week from a town at the base of Mexico's Volcano of Fire have been allowed to return to their homes, even though the peak continues to smolder and occasionally spout ash. The Jalisco state civil defense agency said the volcano's eruptions had quieted enough to allow residents of the village of Juan Barragan to return to their homes Monday, but that officials and residents would remain on alert. The agency said Monday's eruptions sent ash only about a mile high, lower than last week's blasts. The residents of Juan Barragan, about five miles from the peak, had spent almost a week in an improvised shelter in the nearby town of San Marcos. Straddling the border of Colima and Jalisco states, the Volcano of Fire has unleashed six spectacular eruptions in the past four weeks, some of which sent ash as much as three miles above the crater of the 12,533-foot volcano. The volcano, located 430 miles west of Mexico City, is considered to be among the most active and potentially the most destructive of the volcanoes in Mexico. Seismologists say the increasing frequency of the eruptions and their intensity are signs the volcano was returning to an explosive stage like one that started in 1903 and climaxed with a massive explosion 10 years later that left a 1,650-foot-deep crater at the volcano's peak and scattered ash on cities 240 miles away. Records aren't clear if there were any casualties. Welcome to Mexico's newest ghost town, permanent home to six stubborn farmers, a few hundred cows and one of the world's most menacing volcanoes. Authorities ordered the village's other 60 residents, who live only four miles from the volcano's crater, to leave this week after the Colima Volcano thunderously exploded, launching lava and rock miles into the air and covering a large swath of the region with ash. The explosion last Monday night was the largest for Mexico's "Volcano of Fire" in 20 years. It was one of a dozen major blasts since May 10 and specialists worry a major eruption is brewing beneath the soil of the tiny Pacific state of Colima that could threaten or disrupt the lives of about 400,000 people. 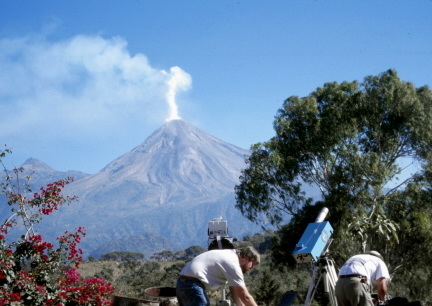 "We're looking at a (worst-case) scenario compared to what happened at Mount Saint Helens in 1980," said Mauricio Breton, a University of Colima volcano expert who monitors the colossus' activity. "If that were to happen, the city of Colima would be seriously affected," he said. At 16 miles from the crater, Colima usually just ignores its picturesque neighbor. But the recent explosions have given residents of the capital a taste of life in the foothills of an active volcano. "It sounded like a transformer exploding. The windows shook," said Rocio Torres, a Colima resident who used to tell relatives in Mexico City that the volcano didn't worry the people in the city. "Now there's a lot of panic," she said. Yet the resilient villagers of the tiny village named after a revolutionary general are more bothered by the evacuation order than the volcano. Most say they have no fear for their safety, and quietly enjoy raising cattle and planting corn on lush hills dotted with large pines and filled with the chirping of brightly colored songbirds. "They take people out of here almost by force. If everyone could make their own decision, no one would go," said Amador Cardenas, 54, one of the few farmers to defy the evacuation order. Cardenas said he has 346 acres and about 70 head of cattle. He says the rain of ash and the lava-induced fires in the foothills have led to food shortages that have killed at least five of his cows. If authorities wanted to be useful, he said, they'd be more concerned about his livelihood. "No one worries about the animals. This is an environmental disaster," he said. The Colima Volcano stands 11,960 feet above sea level and is one of two active volcanoes in Mexico. (The other is about 20 miles from Mexico City). It has a centuries-old history of eruptions but was quiet for most of the 20th century. Its current rumblings date to 1998 but the last month has been its most active in a generation. Ash from Monday's explosion covered nearby highways, forced a two-day closure of the Colima international airport and prompted authorities in the state of Jalisco, which borders on the volcano, to recommend school closures until the health-threatening ash could be removed from school grounds. As of Saturday, Juan Barragan is the only community to have been evacuated. Specialists say the eruptive period could be either a prelude to a major eruption, like one that occurred in 1913, or just peter out. "It could last months or days or it could last years," said Breton. Alberta Altamirano, who claims she is 113 years old, remembers the 1913 eruption like it was yesterday. "It killed a bunch of cattle down by the river," she said from her home in La Yerbabuena, a community opposite Juan Barragan on the south side of the volcano. 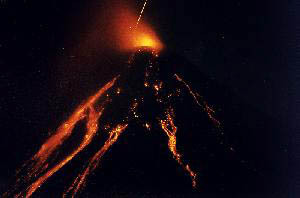 Altamirano said last week that the eruptions don't scare her and she's resigned to her fate should the volcano blow. "God brought us here, so if the volcano explodes, we'll just burn here," she said with a wrinkled smile. Not if Civil Protection authorities and the Mexican military can help it. Personnel from both organizations outnumber inhabitants in the handful of towns within five miles of the volcano, and are ready to evacuate, by force if necessary, anyone who stays behind in the event of a major explosion. This would cause havoc. Civil protection authorities estimate that there are about 25,000 people who would have to be evacuated in the case of a major eruption. Representatives from both states disagree with the University of Colima's predictions that Colima could be seriously affected. Though believed to be a few miles out of range of lava flows, landslides and flaming projectiles, a heavy layer of volcanic ash could bring the city to a grinding halt. "But that's a situation. ... that's totally improbable," said Jalisco Civil Protection spokesperson Jorge Sapien. Judging by the haphazard evacuation of the inhabitants of Juan Barragan, authorities might be counting on the "Volcano of Fire" going back to sleep in the near future. "It's very disorganized," said Maria Guadalupe Ramirez, 54, about the management at her temporary shelter. She has lived through at least three similar evacuations since 1998 and says this has been one of the worst. "I hope it's over soon," she said. Volcano on Saturn's moon, Titan. TITAN appears to have a volcano that spews methane into the atmosphere, a finding that helps to explain an enduring riddle surrounding the Saturnian moon, according to a study published last week.Infra-red images of Titan were taken by the US probe Cassini in a flyby on October 26 last year. Analysis of them by a US-French team, published in the British weekly science journal Nature, points to a "cryovolcano" some 30km across with winged outflows. Unlike terrestrial volcanic mounds, which are formed by the upwelling of lava, this feature is probably formed by plumes of frozen methane, forced from underground, which then slowly evaporate into methane gas. 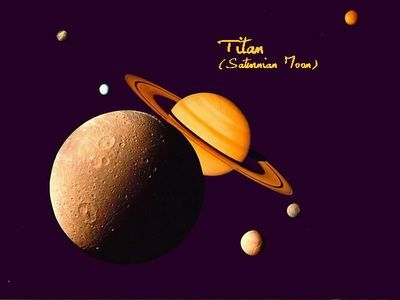 Titan is the only moon in the Solar System to have a substantial atmosphere, a thick mix of nitrogen and methane. It is suspected to be undergoing chemical reactions similar to those that unfolded on Earth billions of years ago. That process eventually provided the conditions for life on our planet. Scientists have long pondered the source of Titan's methane, given that this chemical should have been degraded by the weak light from the Sun within a hundred million years or so. The answer, says the study, is that the methane supply is continually replenished by volcanic eruptions, which could be driven by heat from a tidal movement of liquids that whirl around beneath Titan's surface as the moon swings in an elliptical orbit around Saturn. Contrary to widespread speculation, "the images show that a widespread methane ocean does not exist," it says. Scientists had wondered whether Titan's relatively uncratered surface meant that it was awash with liquid methane, but it appears likely that this youthful appearance is simply methane ice, continually refreshed by the eruptions. Cassini went into orbit around Saturn on July 1 2004 on a mission devoted to observing the giant's rings, atmosphere and satellite. It dispatched a European probe, Huygens, on a one-day suicide mission to Titan that relayed home reams of data and more than 300 pictures. People tend to remember the dates of important events in their lives. In addition to anniversaries and birth dates, volcanologists remember the dates of eruptions they witnessed — at least the big ones. June 12 stirs such memories in some HVO staff members. In 1991, the first explosive eruption of Mount Pinatubo occurred on June 12. This was a precursor to the climactic eruption of June 15 — the second largest eruption of the twentieth century. Pinatubo had been sleeping for about 500 years before it began to stir. Aside from a few geologists, most people who lived around Mount Pinatubo in Luzon, Philippines, didn’t even know it was a volcano. The first vague hint of trouble arose in July 1990, when a small earthquake shook the Pinatubo area just a few hours after a magnitude-7.8 earthquake occurred about 100 km (62 miles) away. Other small earthquakes were felt around the volcano in succeeding days; a few weeks later a landslide was reported. These early phenomena were not interpreted as eruption precursors, but as effects of the magnitude-7.8 earthquake. In mid-March of 1991, numerous small earthquakes were felt near Pinatubo, and on April 2 explosions occurred along an old fracture on the volcano’s north flank. These explosions ejected only old rocks and ash — there was no evidence of new magma. Fumaroles near the center of Mount Pinatubo began to belch dense jets of white steam. Portable seismometers brought in to monitor the activity revealed that tens to hundreds of small earthquakes were occurring near the volcano each day. Volcanic unrest accelerated on June 3, when a small explosion occurred in the vicinity of the fumaroles. The steam plumes from the fumaroles became progressively darker as they carried an increasing quantity of ash. Seismicity escalated. A recently installed tiltmeter indicated that the volcano was tilting outward: it was inflating. Seismicity and outward tilt increased until late afternoon on June 7, when a plume of steam and ash rose about 7 to 8 km above the volcano. At this point, the seismicity diminished and the tilting stopped. 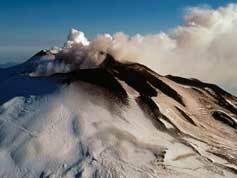 The next morning, a small lava dome was observed growing on the volcano’s north flank. This new lava was piling up where it exited the ground because it was too viscous to flow away. The growth of the lava dome was accompanied by increasing ash emissions, swarms of shallow earthquakes, and periods of continuous rhythmic seismicity known as harmonic tremor. On the morning of June 12, a large explosive eruption — lasting 38 minutes — propelled a vertical column of ash more than 19 km (11 miles) above the volcano. Three more eruptions produced vertical ash columns: one late on June 12th, one on the 13th, and one on the 14th. Each had a shorter duration, and each produced less ash than its predecessor. Each of the first four eruptions sent ash to great heights above the volcano. The ash was then dispersed by winds as it fell through the atmosphere, depositing relatively thin layers of ash over a very broad area. Yet another eruption occurred on the afternoon of June 14, but its character was different than the first four. Instead of rising to a great height and producing vertical fallout of dispersed ash, the eruption column formed a fountain of ash and gas. As the mixture of ash and hot gas poured down around the vent, it formed ground-hugging clouds that moved away from the volcano in all directions at high speed. This phenomenon — known as a pyroclastic surge — incinerates and blasts everything in its path. Twelve more surge-producing eruptions occurred, with successively shorter repose intervals between them, each successively smaller than its predecessor. All of this had just been the warm-up act for the main event, which began in the early afternoon of June 15. In a little more than three hours, about 5 cubic km (1.2 cubic miles) of ash was erupted — about half of it as pyroclastic flows within 17 km (10.5 miles) of the volcano and the other half as widely dispersed ash. As material erupted from the magma chamber, the volcano collapsed, producing countless earthquakes, many large enough to be felt in Manila, 90 km (56 miles) to the southeast. The eruption cloud reached a height of 35-40 km (22-25 miles) above sea level and released about 20 megatons of sulfur dioxide into the stratosphere. This gas forms an aerosol that reflects sunlight. As a result, global warming was slowed for several years. Now, 14 years later, what had been a mountain is a crater lake 2.5 km (1.5 miles) in diameter. Activity Update Eruptive activity at Pu`u `O`o continues. On clear nights, glow is visible from several vents within the crater and on the southwest side of the cone. The PKK lava tube continues to produce intermittent surface flows from above the top of Pulama pali to the ocean. Three ocean entries were active as of June 9. The largest is at East Lae`apuki, with smaller entries at Kamoamoa and East Kamoamoa. Surface flows are intermittently active inland of the entries. The East Lae`apuki entry is the closest activity to the end of Chain of Craters Road, in Hawai`i Volcanoes National Park, and is located about 4.5 km (3 miles) from the ranger shed. Expect a 2-hour walk each way and bring lots of water. Stay well back from the sea cliff, regardless of whether there is an active ocean entry or not. Remember — the beaches that sometimes form next to an active bench are just as dangerous as the bench itself. Stay off both, and heed the National Park warning signs. During the week ending June 8, no earthquakes were reported felt on Hawai`i Island. Mauna Loa is not erupting. During the week ending June 8, eight earthquakes were recorded beneath the summit area. Four were deep and long-period in nature. Inflation continues, but at a slightly reduced rate over the last few weeks. Could hot eruptions cool the Earth? Volcanic eruptions may be an agent of rapid and long-term climate change, according to new research by British scientists. Vincent Gauci and co-authors Nancy Dise and Steve Blake of the Open University simulated the volcanic acid rain from one of Europe's largest historical eruptions, the Icelandic Laki eruption of 1783, which caused widespread crop damage and deaths around Europe. Their finding are scheduled for publication in the American Geophysical Union journal, Geophysical Research Letters, later this month. Gauci says, "we know that volcanic aerosol [airborne] particles reflect the Sun's rays back out to space and also create more clouds that have the same effect. It all helps to cool the planet for a year or two. These simple physical relationships have been known for a while. Our findings show that volcanic eruptions have another, more indirect, effect: the resulting sulfuric acid from the volcano helps to biologically reduce an important source of atmospheric greenhouse gases. At the extreme, this effect could cause significant cooling for up to 10 years or more." Blake says, "The amount of sulfur dioxide put out by Laki in nine months was ten times more than the amount that now comes from all of western European industrial sources in a year. That would have caused a major natural pollution event." The researchers found that such eruptions create a microbial battleground in wetlands, with sulfate-reducing bacteria suppressing the microbes that would normally produce the powerful greenhouse gas methane. In other words, the sulfate-loving bacteria are victorious over the microbes producing methane, leading to a cooling effect. "We did the simulation on a peat bog in Moray in northeast Scotland, an area we know was affected by the volcanic fallout from the Laki eruption," adds Gauci, "and found that the reduced methane emission lasts several years beyond the end of the acid rain. Our calculations show that the emissions would take many years to recover--far longer than volcanoes are currently understood to impact on the atmosphere." The researchers now think that volcanoes may exert a more powerful influence over Earth's atmosphere than was thought. Volcanoes may even be a more important regulator of wetland greenhouse gases than modern industrial sources of acid rain. "Wetland ecosystems are the biggest source of methane and for the most part are located in areas of the world that are remote from industrial activity. But many of Earth's wetlands seem to be located in volcanically active regions such as Indonesia, Patagonia, Kamchatka, and Alaska. Even some wetlands that are quite far away from volcanoes, such as those in Scandinavia or Siberia, will be regularly affected by Laki-like pollution events from Icelandic eruptions" says Gauci. Gauci adds that there was a period of Earth's pre-history when this effect may have created important climate changes. "This interaction may have been particularly important 50 million years ago, when the warm greenhouse climate of the day was due, in large part, to methane from the extensive wetlands that covered the Earth at that time. During that time, large volcanic eruptions could have been real agents of rapid climate change due to this mechanism." The research also points to a long recovery period for wetland ecosystems that have experienced industrially-derived acid rain. Gauci says, "We've been getting on top of the sulfur pollution problem in Europe and the U.S. for a long time now. Our findings show, however, that the effects of acid rain can still linger for a long time." If last December’s tsunami virtually wiped off Andaman and Nicobar Islands from the tourism map, another natural phenomenon now holds the promise of bringing visitors back in droves. The awe-inspiring sight of a volcano spewing lava on this island and smoke blowing from many other hills since last May gladdened the hearts of all on board the MV Onge that recently took tourism department officials and this correspondent to explore the tourism potential — and feasibility — of the place. Convinced about the magnetic pull and safety for tourists of this once-in-a-lifetime marvel, the administration is now planning to run regular boats to the country’s only active volcano. Though the promise of having breakfast on the island could not materialise for those on board as the sea was rough, no one was complaining. The volcano was constantly oozing lava from the bottom of the earth — believed to have been shaken by the massive quake — and most of the smoke flew up in the sky to become dark clouds. Water near the island was hot and seagulls were missing in action. While going round the eight-sq-km circular island that rises very suddenly out of the sea, dust from this smoke covered the heads of people on the upper deck of the ship. At one place, the constant flow of eruptions into the sea had formed a virtual lava bed. After getting a favourable report from officials back from the trip, lieutenant-governor Prof Ram Kapse later told this reporter: "With lava and smoke being emitted, it will be a great attraction and a totally different experience for visitors. We may consider opening the island for tourists." The volcano appears to have put tourism in a win-win situation. As long as the volcano is active, people would love to view that sight. Once it goes back to sleep and the lava cools off, people may be allowed to scale the volcano and see its mouth. Reaching the island by boat takes over six hours and maybe a bout of sea sickness, depending on the weather and how rough the water is. Barren had come to life in 1991 after a gap of 107 years for about 15 days and it was then active from December 1994 to January 1995. Andaman, in fact, has three volcano sites — Barren (active) and Narcondum (dormant) islands and the mud volcano at Baratang that’s barely a few hours drive from Port Blair. Baratang is also home to beautiful limestone caves. The governor said that even the mud volcano activity has increased now. After the quake, this was expected. But there is no danger of any kind and it's perfectly safe to view these sights, he said. Ice volcanoes, they are out of this world! Titan, one fo Saturn's moons, has ice volcanoes. Saturn's moon Titan does not possess the exotic methane oceans that many experts thought it might have, but the Cassini space probe may have spotted something just as strange - volcanoes that spout a brew of icy, tar-like goo. An international team of researchers reached those dual conclusions in a study of Cassini images to be released Thursday. Although they found none of the vast, flat expanses that would mark an ocean, the scientists spotted one spiral formation about 19 miles across that may be an ice volcano. Such "cryovolcanoes" could explain the methane in Titan's thick atmosphere of orange haze. The methane would have disappeared ages ago if something were not replenishing it. Experts say it's possible that a mix of water, methane and ammonia flows beneath Titan's surface, like molten rock within the Earth. Eruptions at the surface could release the methane into the atmosphere. Although the temperature is thought to be minus 150 degrees Fahrenheit even inside Titan, ammonia would keep the water semi-liquid. The "lava" that emerged at the surface would look like nothing normally seen on Earth. "If you touched it, your hand would be frozen immediately," said Bob Brown, a professor of planetary science at the University of Arizona and co-author of the paper in the journal Nature. "Water with ammonia at these temperatures is gooey and sticky, with the consistency of slightly warm tar," Brown said. Another expert likened the substance to cold waffle syrup. 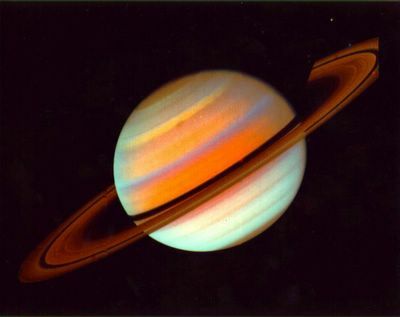 Titan, which is larger than the planet Mercury, is the only moon in the solar system with a dense atmosphere, made mostly of nitrogen and small amounts of methane. The Cassini mission is the first chance experts have had to pierce the thick cloud cover with detailed infrared imaging and radar mapping. The absence of methane oceans on Titan came as something of a surprise to planetary scientists. Before Cassini arrived at the planet last year, such oceans were "the most widely accepted explanation" for the methane in Titan's atmosphere, study leader Christophe Sotin said in a statement from NASA's Jet Propulsion Laboratory. Instruments that measure the sloshing of ocean waves were part of the Huygens probe, which was released from Cassini and landed on Titan earlier this year. That mission's failure to see large bodies of liquid methane, combined with the new Cassini results, means any bodies of liquid would be no bigger than lakes or puddles, Brown said. "If there were an ocean or something the size of the Gulf of Mexico, we would have seen it," he said. Yet Huygens did spot winding channels that may have formed from the flow of liquid methane and could be linked to volcanic eruptions. Methane from the eruptions may collect in the atmosphere and rain periodically onto the surface in what Brown called "methane thunderstorms." That could help create small, short-lived channels like the ones Huygens saw. "It's obvious that this landscape has been scoured by floods," said study co-author Larry Soderblom, a geophysicist with the U.S. Geological Survey in Flagstaff, Ariz. The bright, circular feature that resembles a volcano popped out in images because it looked like a snail's shell, team members said. A black spot in the middle would be the caldera, or basin, and the rings of the "shell" may be layer upon layer of frozen material ejected from the volcano. That conclusion is speculative, but it's a reasonable interpretation of the feature, said Dave Stevenson, a professor of planetary science at the California Institute of Technology who was not involved in the study. "It's difficult to explain in any other way," said Stevenson, who was among the first scientists 20 years ago to propose that Titan had oceans composed of methane and ethane. Stevenson said the paper did not address a key point - whether volcanism is enough to explain the methane in Titan's atmosphere. The apparent volcano could still turn out to be an ordinary impact crater from a meteor, according to researcher Louise Prockter of Johns Hopkins University, who wrote a commentary on the study for Nature. Experts hope to study the feature more closely in the coming years as Cassini, which is in orbit around Saturn, makes at least 40 more passes by Titan. "We are only at the beginning of this fantastic journey," Prockter wrote. Volcano of fire gets all fired up! Volcano of Fire has people evacuate villages near Mexico City. Mexico's Volcano of Fire has been hurling hot lava into the air and dusting surrounding towns with ash, forcing evacuations and raising concerns of a much larger explosion. The eruptions are the strongest recorded since scientific monitoring began 20 years ago, and even long-skeptical residents acknowledged Wednesday a newfound fear of the peak that straddles the line between Colima and Jalisco states, 690 kilometers (430 miles) west of Mexico City. The volcano has had six spectacular eruptions in the past three weeks. The largest, late Monday, shot glowing lava five kilometers (three miles) above the crater of the 3,820-meter (12,533-foot) volcano and showered ash over the nearby city of Colima. Authorities handed out surgical masks to protect against breathing the fine grit, but so far the volcano has caused no major injuries or damage. "The ground shook, and there was this roar, and people came running out of their houses," Maria de Jesus Chavez, a 17-year-old high school student, said as she sat outside her home in San Marcos and watched the volcano with her family. Seismologist Tonatiuh Dominguez said the increasing frequency of the eruptions and their intensity signaled the volcano was returning to an explosive stage like one that started in 1903 and climaxed when a massive explosion in January 1913 left a 500-meter (1,650-feet) deep crater at the volcano's peak and scattered ash on cities 400 kilometers (240 miles) away. "It's possible that we will see another one like 1913 in the coming decade." Federal Civil Protection Coordinator Carmen Segura was traveling to the volcano zone Wednesday and said officials planned to improve monitoring of the volcano. Residents of three towns -- Juan Barragan, El Borbollon and Yerbabuena, all eight kilometers (five miles) from the peak -- were asked to leave voluntarily on Monday. Most have followed the request. "People had become pretty skeptical in recent years, because they have been evacuated before and then nothing happened," said Luis Rodriguez, civil defense coordinator for the state of Jalisco. But he said attitudes had changed with the latest eruptions. Many witnessed Monday's explosion while waiting for buses to take them away. "People who hadn't got on the bus said suddenly, 'Hey, make room for me,"' he said. Dozens of evacuees slept at an improvised shelter in San Marcos, 12 kilometers (7.5 miles) from the summit. Before dawn Wednesday, families sat outside their homes, casting nervous glances at the peak. "There are a lot of people who would like to leave, because this time they think it could really reach us," Chavez said. A few families have insisted on staying, concerned their few possessions might be stolen or that they might be forbidden to return. About 300,000 people live within 40 kilometers (25 miles) of the volcano. Authorities have established an off-limits zone 7.5 kilometers (4.5 miles) around the crater and an alert zone was in effect for 11.5 kilometers (7 miles). The volcano has had more than 30 periods of eruptions since 1585, including several significant eruptions in the late 1990s. It came to life again on May 23, sending a pyroclastic flow of burning gas and rock fragments more than four kilometers (2.5 miles) down the slopes and sending clouds of ash three kilometers (two miles) into the air. Similar eruptions occurred on May 30, Thursday night, Friday morning and Sunday afternoon. Ash coated cars and streets in the state capital, Colima, about 30 kilometers (20 miles) from the peak, and authorities recommended residents wear masks and sunglasses or goggles to avoid respiratory and eye irritations. The volcano is considered to be among the most active and potentially the most destructive of Mexico's volcanoes. This is a beautiful picture of Kilauea volcano in eruption. This morning's activity is a clone of yesterday's. The three branches of the PKK flow all have visible breakouts on and below Pulama pali. The west is the largest, the east is in second place, and the middle, at an intermediate level on the pali, is the smallest. The front of the west branch is the lowest, at about the 300-foot elevation. Both ocean entry areas are active this morning, with East Lae`apuki much the larger, having at least three places where lava is actually pouring off the delta into the water. All vents are incandescent in Pu`u` O`o's crater this morning, though often hidden by rain. Background volcanic tremor remains above the norm at Kilauea's summit. Volcanic tremor is at a moderate level at Pu`u `O`o. The summit continues to inflate slowly. Uwekahuna shows about 1.3 microradians of inflation since June 4. The tilt at Pu`u `O`o has averaged flat over the past 24 hours, dropping sharply at midday yesterday but recovering by midnight. The spikey nature of the Pu`u `O`o tilt is something that has characterized that record for many month. This is a great picture of Mount Vesuvius volcano eruption. An eruption of Mount Vesuvius, near Naples in Italy, could kill as many as the Indonesian tsunami, says a British researcher. But lessons learned from the 1997 eruption on the Caribbean island of Montserrat could reduce the damage, he says. "Vesuvius is one of the most serious problems facing Europe," says Peter Baxter of Cambridge University's Department of Medicine, who collaborated with volcanologists and civil engineers on the Montserrat study. Baxter and his colleagues are members of a European project called Exploris, which is studying the human risks of eruptions and how to mitigate them. 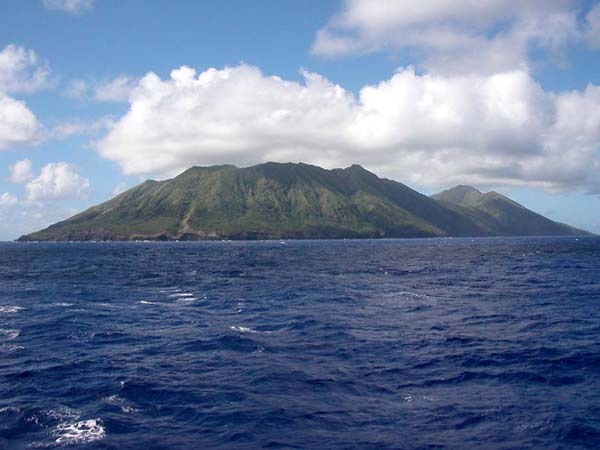 As well as Vesuvius and Montserrat, Exploris is looking at hazards posed by Mount Teide in the Canary Islands, Sete Cidades in the Azores, and others.The activity at the Soufrière Hills Volcano in Montserrat began in 1995, but the worst damage happened in 1997, when fast-flowing streams of hot gas and ash, called pyroclastic flows, struck several villages. The same kind of eruption devastated Pompeii in 79 AD.Baxter's team looked at the effects of a pyroclastic flow on 26 December 1997. They found that the flow, already hot enough to ignite furniture and other materials, became even more damaging as it picked up debris and hurled it at buildings1.Running hot and coldThis volcanic flow was not the "turbulent mess" that has often been assumed, says Baxter. The pressure of the hot gas was surprisingly low, and it caused much of its damage by entering buildings through open windows and doors.These streams became highly focused. Like gusts of wind, they come in one window and go out another. A person cowering in a corner might escape the scorching material untouched.Baxter says that people have assumed that pyroclastic flows would batter buildings down. But the Montserrat study shows that heat-resistant coverings on windows and doors could greatly reduce damage to buildings, he says.The Neapolitan authorities plan a mass evacuation if Vesuvius threatens to blow, as one day it surely will. But they estimate that it could take at least five days to clear the area, and pyroclastic flows might strike sooner than that. "We just don't know how much time we'd have," says Baxter. Protective barriers for windows might save lives.Choke and burnBaxter and his colleagues plan to use the Montserrat data to develop a computer model of an eruption of Vesuvius. A new study of the effects of such flows on the Roman city of Pompeii, by Lucia Gurioli of Italy's National Institute of Geophysics and Volcanology in Pisa and coworkers2, might aid their efforts. Gurioli's team estimated the temperatures in Pompeii from the amount of magnetism left unmelted in rocks and building fragments. By mapping the temperatures throughout the remains, the researchers could see how the shapes and arrangements of buildings and streets set up turbulence that could have cooled the flow in some places. The findings paint a bleak picture. The town, nine kilometres southeast of Vesuvius, was smothered in about 2.5 m of ash even before the 300 °C pyroclastic flows struck, choking life and caving in roofs. And changes in the flow swirling over walls didn't seem to reduce the temperature below about 100 °C, so survivors of the ash would have burned to death. Civil engineers are interested in the temperature measurements at Pompeii, says Gurioli's colleague Roberto Lanza of the University of Turin, because they offer clues about how soon emergency vehicles could drive into a town struck by pyroclastic flows without their tyres melting. The Colima Volcano in western Mexico has erupted, spewing out burning rock and raining ash on the nearby villages of Tonila y San Marcos, authorities said. The eruption at the 3,820-metre volcano located 690 kms north-west of Mexico City was obscured from view by cloudy weather. But satellite images suggested the volcano sent a plum of ash kilometres into the sky, according to the Jalisco state Civil Protection Department. Patrols were sent to collect more information from settlements near the volcano. The volcano had staged two spectacular eruptions Thursday night and Friday morning, following smaller explosive eruptions on May 23 and May 30. Known as the Volcano of Fire, the summit's first recorded eruption came in 1560. 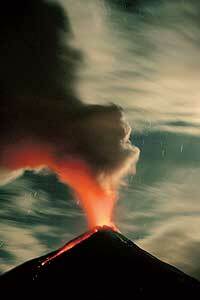 It is considered to be among the most active and potentially the most destructive of the volcanoes in Mexico. "Earth From Space" series is introduced as an additional interest for surfers traveling on Surf Trips. Two sources of information are utilized, namely the European Space Agency (ESA) and the National Oceanic and Atmospheric Administration (NOAA) Operational Significant Event Imagery (OSEI) service. Images taken from space vary greatly in subject, however the environement and meteorology are the principal focus for Surfersvillage. ESA's micro-satellite Proba observes the active Bromo volcano, a popular tourist attraction of East Java in Indonesia located within the Pacific 'Ring of Fire' volcano belt and has more than a hundred active volcanoes within its territory. With around 200 million inhabitants, Java is the most populated island in Indonesia and also the world. The island was formed by ancient volcanic activity. Bromo is one of Java's most active volcanoes, located on top of the 16-kilometre-wide Tenegger Caldera in East Java, with a summit elevation of 2329 metres. The Caldera is part of Bromo Tengger Semeru National Park, situated about 112 km southeast of the East Java capital of Surabaya. The volcano itself is the youngest of the cones at the centre of the Tenegger Caldera. It stands 133 metres above the lunar-like landscape of the Caldera and is 700 metres wide. The smaller, ribbed cone just north of it is the Batok volcano. While Batok is no longer active, the same is not true of Bromo: the volcano has erupted at least 50 times since 1775 and last erupted in June 2004. Its ash cloud reached 3000 metres above the crater rim and stones rained down around the crater to a distance of about two kilometres away. Two visitors were killed and five more left injured by the volcanic activity. Indonesian seismologists estimate that there is a magma chamber buried about a kilometre under the caldera floor, responsible for periodic inflation and deflation events monitored by GPS and levelling techniques. Even in normally active conditions, Bromo still produces volcanic gases including the tasteless and odourless but also poisonous 'mofet' gas made up of carbon monoxide and dioxide. Nevertheless, Bromo is one of the most frequently visited attractions in East Java. The volcano is noted for spectacular sunrises and expansive views across to Semuru volcano to the south. Visitors often cross the caldera floor on horseback. This is a detail from a 19 June 2004 image acquired by the Compact High Resolution Imaging Spectrometer (CHRIS). Built by UK-based Sira Technology, CHRIS is the main payload on ESA's Proba microsatellite, designed to acquire hyperspectral images with a spatial resolution of 18 metres across an area of 14 kilometres. Fresh eruptions were noticed at the Barren Island volcano, India's only live volcano 135 km from Port Blair, on Friday morning. Coast Guard dornier aircraft on regular sorties to the island reported a plume of thick smoke, fresh lava and steam coming out from the crater. Coast Guard DIG S P S Basra told PTI that the volcano had shown activity after being dormant for three consecutive days due to incessant monsoon rains. "It is shooting out lava and stones again since 7:30 this morning", Basra said. The volcano had erupted on May 28 after remaining dormant for 10 years. Last July, hundreds of small earthquakes began rattling Mount Spurr a few miles beneath its snowy summit each day. In response, scientists with the Alaska Volcano Observatory flew to its flanks 80 miles due west of Anchorage. They rushed to install five new seismic stations to better record the shaking. They also installed three GPS stations to see if the mountain was inflating like a balloon due to the pressure of molten rock. "We got lucky Spurr acted up in summer," Tom Murray, scientist-in-charge at the Alaska Volcano Observatory, said recently. "In winter, with the ground frozen and less light, it would have been difficult to mount such a response." Murray and other volcano-watchers throughout the U.S. dislike the current scrambling it currently takes to outfit the most dangerous of the nation's 169 volcanoes with state of the art instruments. He and researchers at the U.S. volcano observatories have written a report that reveals gaps in the nation's volcano monitoring, many of them in Alaska. Murray said the report outlines the holes, but also maps how the volcano observatories hope to fix the problem. Mount Spurr hasn't calmed down since it began percolating last summer. It is one of five Alaskan volcanoes of 18 nationwide that pose a "very-high threat" to people and aircraft. Just three of those volcanoes, all located outside of Alaska, now have the proper monitoring equipment, according to Murray and the coauthors of the paper, John Ewert and Marianne Guffanti, of USGS. In the report, the scientists outline the need for new funding and their plans to bring together the nation's five volcano observatories-Alaska, Cascades, Hawaii, Long Valley, and Yellowstone-for instantaneous information sharing. 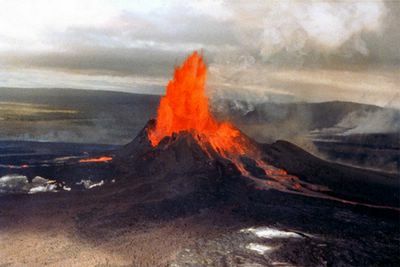 The researchers also envision a round-the-clock observatory for the nation's volcanoes that would be located in Anchorage. "The need would be greatest up here," Murray said. Pimpled with about 90 volcanoes, Alaska has more than half of the nation's total. Volcanologists consider Spurr, Augustine, Redoubt, Akutan, and Makushin very high threats for their proximity to Anchorage and well-traveled Aleutian fishing ports and airways. They consider 26 other Alaska volcanoes as high threats, compared to 11 others in the rest of the U.S.-three in California, two in Hawaii, and four each in Oregon and Washington, including Mt. St. Helens. Right now, scientists at the Alaska Volcano Observatory in Anchorage and Fairbanks look at seismic records twice a day for about 30 volcanoes, and also scan satellite images of volcanoes when they are available. A 24-hour volcano-monitoring center in Anchorage that might employ 10 people would be part of an effort to link all the volcano observatories in the U.S. The center would provide real-time satellite images and seismic and GPS information on Alaska volcanoes to researchers at the other observatories. By sharing information, scientists throughout the country can assist each other during eruptions. Murray can envision an Alaska volcanologist taking the night watch on Mt. St. Helens, for example, by using high-speed Internet connections to gain access to the same seismic, GPS, and satellite information that a scientist in Washington would. It will take about $15 million a year to monitor America's volcanoes with instruments that would give scientists their best shot at predicting eruptions, Murray said. Most important is to avoid the panic of installing instruments when a volcano is erupting. Often the valuable information on a volcano's character comes after years of observing its tendencies. With years of data, researchers can then better predict a volcano's behavior. "You need these instruments in the ground ahead of time for them to be most useful," Murray said. Summer fun is underway at the East Tennessee Discovery Center. Children between the ages of 6 and 8 are taking part in the young scientist fun camp. The 3-day camp offers a variety of exciting chemistry experiments including volcano eruptions. “And even if they don't go away with a deep scientific explanation for everything, they've had fun doing it and they remember it and it might get them interested in doing it down the line,” says Christy Lewis, teacher, Knox County. Additional camps for your young scientists are planned throughout the summer. Colima volcano displays quite an eruption. Colima's volatile Volcano of Fire staged a spectacular midnight eruption, scattering its flanks with glowing rock and spewing ash on nearby towns early on Thursday.No injuries or damage were reported.The Jalisco state civil defence agency said an explosion at 11.49pm shot glowing material 600m into the air. A second blast occurred at 12.22am. The 3 820m peak is the active part of the Colima Volcano complex, which lies 690km west of Mexico City.It also experienced explosive eruptions on May 23 and May 30.The Televisa television network reported that ash fell on Colima City, the capital of the small state of the same name. An explosion shook a volcano in western Mexico Monday, sending a plume of ash and smoke 3 miles into the air and scattering hot rocks on its slopes.It was the largest eruption in at least 15 years at Mexico's most active volcano, said Carmen Segura Rangel, coordinator of civil defense for Mexico's Interior Department. Segura said an off-limits zone would be expanded to 4 1/2 miles around the crater — from 4 miles — though there were no evacuations at the nearest communities, just beyond the new zone.The government of nearby Jalisco state said the explosion was slightly larger than one that shook the 12,533-foot volcano earlier this month. He said there was no immediate danger to settlements closest to the mountain, which is about 500 miles west of Mexico City, but added that similar eruptions were likely in the future.The peak, part of the Colima Volcano complex, is considered one of the most violent in Mexico. A 1913 blast that created a crater 1,650 feet deep. Indian geologists will study molten rock samples from a volcano on a tiny island in the Bay of Bengal to find out if last week's eruption could be traced to December's earthquake and tsunami, experts said on Wednesday. The volcano on an uninhabited island in the tsunami-hit Andaman and Nicobar archipelago has been spewing smoke, dust and lava since Saturday. Indian authorities said there was no immediate threat to the environment and marine life. A team of scientists from the state-run Geological Survey of India (GSI) is leaving this week for Barren Island to collect lava samples, GSI officials said. "Volcanoes and earthquakes happen independent of each other, but there is scope for studying the link in this case," M.K. Mukhopadhyay, a GSI deputy director-general, told Reuters. Another senior GSI scientist said the Dec. 26 earthquake and tsunami caused "re-adjustment of lithospheric plates" that might have disturbed lava pockets and caused the volcanic eruptions. "There is no thumb rule that earthquakes cause volcanoes or vice-versa. But we can study whether the crustal re-adjustment caused by the tsunami disturbed the earth's crust," said the scientist, who did not want to be identified. The volcano, India's only active one, was throwing up molten rocks and gas up to 90 ft in the air but there was no immediate threat to the environment or marine life, said D.S. Negi, chief administrator of the Andaman islands. The Andaman and Nicobar islands are situated on an undersea fault that continues to Indonesia to the south. The island chain has experienced hundreds of aftershocks following the powerful undersea earthquake that caused the Dec. 26 tsunami. Officials say more than 430 people were killed and at least 3,000 are still missing after the tsunami slammed into the archipelago. But voluntary groups say the death toll could be much higher. Can certain mysteries be solved? When 19-year-old Joe Meek first encountered the boiling springs and geysers in what would later become Yellowstone National Park, he immediately thought of the underworld.The young adventurer happened upon the area in the fall of 1829. During a trapping expedition, he wandered into what some historians believe was Norris Basin, one of the largest and most active geyser fields in the world. In a conversation almost 40 years later with biographer Frances Victor, Meek recalled his initial impression of the sulfurous steam columns and bubbling pools. "For some minutes, Joe gazed and wondered. Curious thoughts came into his head about hell and the day of doom," Victor wrote. "Joe found the warmth of the place most delightful after the freezing cold of the mountains, and remarked to himself, 'If this were hell, it were a more agreeable climate than I've been in for some time. '"Today, many visitors share Meek's reaction to Yellowstone's thermal features: Whatever their religious beliefs, it's clear that something strange and awesome is going on down there, under the ground. Just how strange and how far down, though, is a major point of contention among scientists.In the last few years, multipletheories have been proposed to explain how volcanic hot spots like Yellowstone form and endure.Hot spots are long-lived sources of magma typically located away from subduction zones -- away from the "Rim of Fire" and other tectonic margins where most volcanoes are found. Some scientists believe hot spots are created by relatively shallow forces; others insist the magma rises from deep within the earth; still others suggest that extraterrestrial impacts, massive subterranean avalanches or other global events are somehow involved. Within the next few years, new evidence -- much of it related to work being done at Yellowstone -- may help determine which of these ideas is right, or at least which are wrong. "Previously, we had to infer how things occur at depth [because] the data was pretty sparse. It was like looking at a picture with blurry glasses. Now, we're sharpening the image," said Robert Smith, a geophysicist at the Yellowstone Volcano Observatory and chair of the EarthScope Science and Education Committee. EarthScope has been described as the largest earth-science project in history. It will take a multipronged approach to underground imaging, using hundreds of closely spaced Global Positioning System devices to detect ground deformation and seismographs to identify structural features deep below the surface. In a process similar to ultrasonic scanning, the seismographs will use waves generated by earthquakes to paint detailed pictures of the earth's interior. "I think EarthScope will start a revolution," Smith said. "We'll be able to create a 3-D image of geology at depth. We're already getting data in California. "The first seismographs were deployed there last year. Over the next decade, an array of 800 portable units stretching from border to border will systematically roll east across the nation. The array is currently scheduled to reach Montana and the Yellowstone area in fiscal 2007. Once here, it could help determine where the magma comes from that feeds the Yellowstone hot spot.For decades, the standard theory has been that hot spots are created by mantle plumes -- deep-seated thermal anomalies that form 2,900 kilometers below the surface, where the hot, plastic mantle meets the molten outer core.The idea is that extreme conditions at the core-mantle boundary somehow create a blob of partly melted rock. Because it's less dense than the surrounding mantle, the material floats slowly upwards, like goo in a lava lamp.Once the blob nears the surface -- a process that could take millions of years -- the lower pressure allows more of the rock to melt, causing a massive initial eruption called a flood basalt, and then producing the steadier volcanic output of a long-lived hot spot.This theory has attracted increasing opposition over the last 10 years, however, in part because nobody has produced a clear, definitive seismographic image of a deep plume. Several alternatives have been proposed that rely on shallow or surface forces to explain how melts are produced. "The question is whether plumes form at the core-mantle boundary, or if they're shallow anomalies," Smith said. "It's only been in the last few years that we've had the seismic data needed to resolve this issue. "In a precursor to the full-scale EarthScope experiment, Smith and a team of researchers recently established a broad seismic array in the Yellowstone region. They found what appears to be a plume welling up from the northwest. "It extends down to about 650 kilometers," Smith said, which places it near a critical mantle boundary layer. This boundary layer is located about 660 kilometers below the surface. It represents a major change in the chemical or mineral structure of the mantle. "My hunch is that some sort of thermal effect at the 660-kilometer transition zone" caused the plume to form, Smith said.Whether that hunch holds up after EarthScope's full array of instruments monitor the region won't be known for several years. One thing is clear, though: The ongoing research at Yellowstone will play a key role in solving the mystery of hot spots. "If you want to study hot spots, you go to Yellowstone," Smith said. "If you want to study [crustal] extension, you go to the Basin and Range. If you want to study strike-slip faults, you visit the San Andreas. All of these places are in the western United States, and they're easily accessible. The western U.S. is a plate boundary laboratory. "Note: Smith is co-author of "Windows into the Earth: The Geologic Story of Yellowstone and Grand Teton National Parks," which discusses the history and mechanics of the Yellowstone hot spot, its past eruptions and its effect on the regional geology. Touristic hot spots during summer time! Lopes, who studies volcanoes around the globe and throughout the solar system for NASA, wrote "The Volcano Adventure Guide" because people were always asking her for advice on visiting volcanoes. The book explains the science and history of volcanoes but also provides practical information about visiting volcanoes in Hawaii, Iceland, Greece, Costa Rica, the Caribbean, the continental United States and Italy. Lopes explains how to stay safe, where to hike for the best views, and even lists other attractions nearby. In Italy, volcanoes range from Mt. Vesuvius, which has been dormant since 1944, to Stromboli, which has small eruptions every 20 minutes or so that are relatively safe to see from nearby. American sites include Mt. St. Helens and Mt. Rainier in Washington. "The Volcano Adventure Guide," published by Cambridge University Press, is $50. The epicenter of the last earthquake that caused the massive Tsunami in December 2005, is again showing signs of severe seismic activities. According to geologists signs are building of a more massive underwater earthquake or volcanic explosion at that spot which can cause more severe Tusnami. A nearby island of India experienced violent volcanic eruption. The dormant volcano erupted with lava flowing to the ocean. A routine Coast Guard patrol on Saturday witnessed eruptions on Barren Island - a thickly vegetated, three-km-wide strip with a history of volcanic activity dating back to 1787. Inhabited mostly by rats, birds and feral goats, this island lies 135 km north-east of Port Blair on the inner arc extending between Sumatra and Myanmar. “We spotted thick black smoke even 10 nautical miles away from the island,” S Basra, commander, Coast Guard (Andaman & Nicobar) told this website’s newspaper from Port Blair. Indian Reconnaissance and Arial Survey planes had to maintain a height of at least 5000 feet flying over the island. What was a sign of major concern for the Tsunami epicenter was the presence of strange staggering harmonic tremor on the ground all around Andaman and Nicobar islands. “Barren Island is a northward extension of the Java-Sumatra volcanic belt. So violent eruptions are natural,” says volcanologist Chandrasekharam. Some geologists are predicating for some times that the northern extension of the Java-Sumatra volcanic belt will be the cause of Tsunami soon in geological time scale. An explosion shook a volcano in western Mexico Monday, sending a plume of ash and smoke 3 miles into the air and scattering hot rocks on its slopes. It was the largest eruption in at least 15 years at Mexico's most active volcano, said Carmen Segura Rangel, coordinator of civil defense for Mexico's Interior Department. Segura said an off-limits zone would be expanded to 4 1/2 miles around the crater from 4 miles though there were no evacuations at the nearest communities, just beyond the new zone. The government of nearby Jalisco state said the explosion was slightly larger than one that shook the 12,533-foot volcano earlier this month. He said there was no immediate danger to settlements closest to the mountain, which is about 500 miles west of Mexico City, but added that similar eruptions were likely in the future. 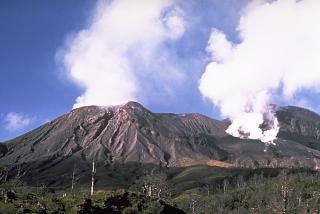 The peak, part of the Colima Volcano complex, is considered one of the most violent in Mexico. A 1913 blast that created a crater 1,650 feet deep. After lying dormant for over a decade, India’s only active volcano on a lonely island in the Indian Ocean has woken up to spit lava—reaching as far as three km from the crater. A routine Coast Guard patrol on Saturday witnessed eruptions on Barren Island—a thickly vegetated, three-km-wide strip with a history of volcanic activity dating back to 1787. Inhabited mostly by rats, birds and feral goats, this island lies 135 km north-east of Port Blair on the inner arc extending between Sumatra and Myanmar. ‘‘We spotted thick black smoke even 10 nautical miles away from the island,’’ S Basra, commander, Coast Guard (Andaman & Nicobar) told The Indian Express from Port Blair. Senior officers of the Integrated Command who conducted an aerial survey of the area on Saturday confirmed the volcanic activity. The signal sent by the Naval Area Coordinator this morning issued an advisory to defence establishments to maintain a minimum height of 1,000 metres while flying over the island. Basra’s team returned with lava samples that would interest geologists. ‘‘We managed to collect only small samples, because they were too hot,’’ he says, adding that barely three months ago the island was peaceful but for ‘‘miniscule’’ smoke. A joint team of Indian and Italian scientists led by D Chandrasekharam from IIT Mumbai’s department of earth sciences were the first to camp on Barren Island for four days in February 2003. ‘‘Barren Island is a northward extension of the Java-Sumatra volcanic belt. So violent eruptions are natural,’’ says volcanologist Chandrasekharam. The expedition discovered two fresh water springs there. The last eruptions were recorded in 1994-95 but the island is also remembered for belching lava for six months in 1991. A close watch is being maintained on the island and the Geological Survey of India has already been informed of the volcanic activity. India's only one volcano on Barren Island in the Andaman started emitting smoke on Friday, defence sources said on Monday. The Barren Island is about 140 km northeast of Port Blair and is about 3 km in diameter. A routine Coast guard patrol on Saturday had witnessed the billowing smoke and flame from the volcano in Barren Island. They also found themselves stepping on fresh black lava. "It was so hot we knew something was wrong. And then we saw the crater spewing red flames. It was the most amazing sight I’ve ever seen," team leader and Coast Guard deputy inspector-general S P S Basra told reporters on Monday. The team returned with lava samples for geologists.